A teenager and his mother move into a small town after the death of his father, where she it to take up the role of deputy-principal. Almost immediately he meets an attractive girl who lives next door, but is warned off from making friends with her by her father. When he hears screaming from next door he calls the police, and joins them as they ask to look inside the house, but the father says it is all due to a TV programme. Thereafter he and a friend sneak into the house and find a shelf of books; opening one they release a monster. The father is revealed to be author R.L. Stine and this monster and others, the products of his imagination. But how can they be controlled? The boy, Zach, and the girl, Hannah, sneak off and go on an abandoned ferris wheel. The boys wander about in the house. Monsters, which are those from the stories written by the real Stine, are released and attack the town. The author and the young people dash about trying to control things. They make a plan and in the climax put it into effect. There was absolutely nothing to offend anyone in any part of this movie, even the werewolf wears shorts. A View Without knowing anything about R.L. Stine my wife and I thought this was good fun, and I was surprised to find that he was a real person and that the fictional monsters were actually featured in books. I thought it all worked pretty well in the first two acts, but the final thirty minutes or so were a bit frantic, and despite the originality of the premise, just followed a familiar groove, but just for once I am able to say good family viewing. 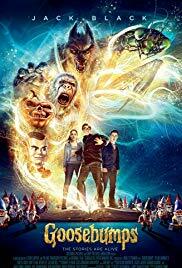 Source of story The “Goosebumps” books written by R.L. Stine. Additional Info According to the cast list the film features 28 monsters.